Our Golden Taklon brushes are made of the finest synthetic fibers. They are blended in different diameters to make the brush perform like natural hair. 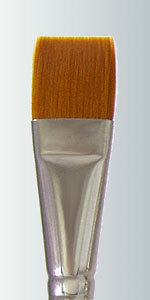 They are excellent for use with acrylics, oils, china paints, alkyds, and other mediums. The combination of quality fiber and construction give these brushes the ability to hold their shapes without spreading or splitting. This provides exceptional control with any medium. The larger sizes are perfect for floating, varnishing, and basecoating. Keep in mind that all Golden Taklon brushes on the market today are not the same quality.